Is the GeForce GTX 480 fashionably late, or just plain late? ATI has been tooting the DirectX 11 horn for quite some time now, while their competitors labored on a rebuttal. At long last, Nvidia's first DirectX 11 graphics card is here -- and for better or worse, it's quite a beast. The card is based on Nvidia's new Fermi architecture. The feature-list is considerable: over 3 billion transistors, double the processing units of its predecessors (though ATI and Nvidia count these differently), and a strong emphasis on geometric realism. Nvidia's Fermi page is chocked full of information and demonstrations, and includes white papers detailing the strides they've made. Priced at $500, the GeForce GTX 480 is squarely aimed at . . . no competing product. The obvious target would be the reigning graphics card champ, ATI's Radeon HD 5870 -- but that card can generally be found for about $400. The 5870's bigger brother would be the next logical step, but that's a dual-GPU card, and it typically falls into the $700 range. As the GTX 480 is Nvidia's fastest single-card GPU, we opted to center our first look at the part around ATI's fastest single-card GPU, the Radeon HD 5870. To even the playing field a bit, we also took a look at MSI's R5870 Lightning -- a factory overclocked HD 5870 priced at $500. High-end components deserve a high-end test bed: Ours is equipped with Intel's Core i7-975 Extreme Edition processor, a DX58SO motherboard, 6 GB of RAM, and a 1300W power supply. All tests were performed at 1920-by-1200 and 2560-by-1600 resolutions on a 30" display, and highest settings (unless otherwise noted). While generally not indicative of real-world performance, synthetic benchmarks are a generally accepted industry standard, and can help us get an general idea of how these graphics cards will perform in the wild. We started with a look at graphics tests using Futuremark's 3DMark Vantage. 3DMark offers a pair of DirectX 10-based game demos, which emulate a typical game's strain on a graphics card. One test emulates an indoor action sequence, simulating cloth, light and water reflection, and static object rendering. The second test takes place in outer space, simulating shadow-mapping, and rendering large scenes consisting entirely of moving objects. The scores were close: the GTX 480 saw a neglibeble 0.1% gain over the 5870, while the overclocked R5870 took the lead with a gain of almost 4% over the GTX 480. 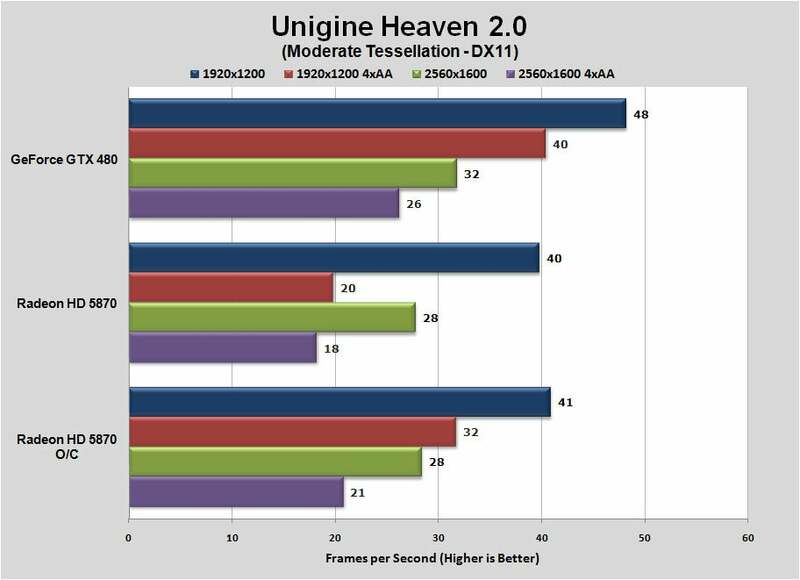 For our second synthetic test, we used the latest release of Unigine's Heaven Benchmark. Heaven is a DirectX 11-based game engine, designed to make the most of next-generation technologies. There is no actual game behind the benchmark's fantasy setting, but the benchmark cycles through a few scenes, offering an idea of what navigating the world under a variety of settings could look like, and how strenuously it would tax your system. Nvidia has been beating the geometric realism drum for some time now, and Heaven's tessellation feature set made for an ideal test scenario. Hardware tessellation consists of breaking down polygons into smaller pieces. This results in an improved level of detail, with visually complex in-game models. While the technology isn't new, it has typically been relegated to 3D models in films -- to date, graphics cards haven't been able to achieve a satisfying level of performance while employing tessellation. The results of our Heaven benchmark are pretty much in line with that assessment. The GTX 480 leads the pack, particularly once anti-aliasing is turned on. Of note: we performed these tests at Moderate tessellation, which is generally indicative of the level of tessellation we'd see in games today. 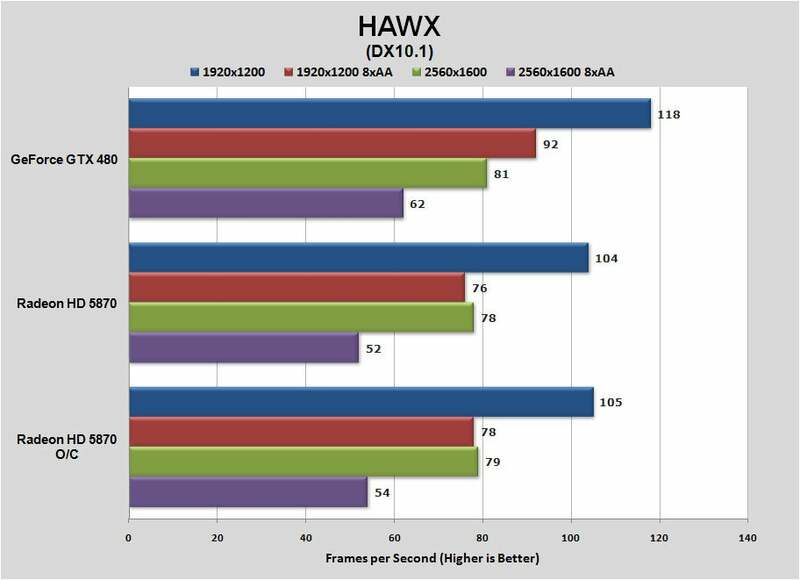 The Heaven benchmark also offers Normal and Extreme tessellation modes, but both of our 5870s posted exceedingly low frames -- on the order of 1 - 3 frames per second -- when we pushed the benchmark to its upper limits. The fault lies with the video memory: Nvidia's card is bundled with 1.5GB of video memory, while our 5870s are limited to 1GB. When pressed, the GTX 480 didn't post playable frame rates, but managed to complete the benchmark. At the 1920-by-1200 resolution under Extreme tessellation at 16x anti-aliasing, we saw an average of 25 frames per second. With the same test at a 2560-by-1600 resolution, we saw 17.3 frames per second. Neither one makes a very good gaming experience, but it does show quite a bit of potential for tessellation, later on. 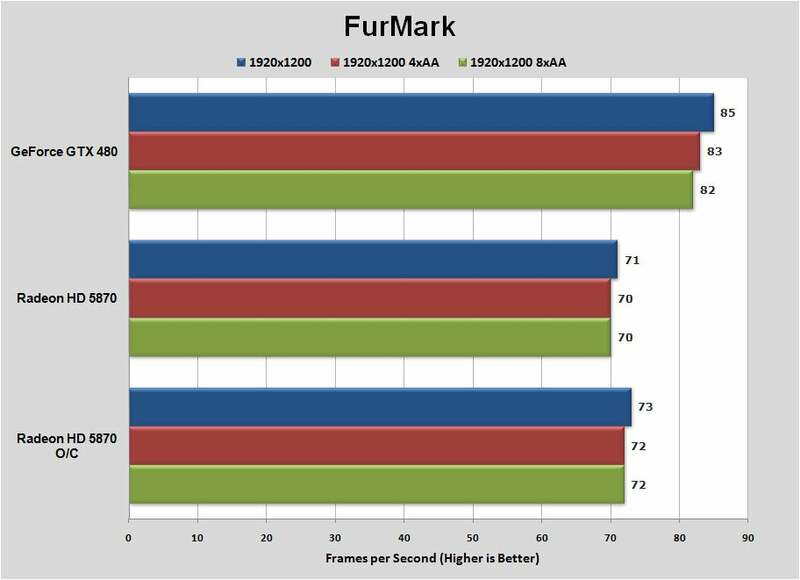 For our final synthetic test, we used FurMark -- an open-sourced, OpenGL benchmarking tool. It's tests are based on fur-rendering algorithims to test, and place rather extreme levels of pressure on a GPU in the process. Our tests were conducted at a resolution of 1920-by-1200 pixels, at 0x-, 4x-, and 8x-multi-sampled anti-aliasing. As our handy chart shows, the GTX 480 lead the pack, followed by the overclocked 5870. Keep in mind however that synthetic benchmarks are not the greatest measure of actual performance -- and this disclaimer goes doubly so for FurMark. You'd be hard pressed to find an application that will stress a graphics card as exhaustively as FurMark does -- and there have been instances where warranties were voided. Where FurMark does excel, however, is in giving us a good idea of what these cards would look like when operating at their upper limits. During a minute-long FurMark run we saw the GTX 480 get as hot as 95 degrees Celsisus -- that's 203 degrees Farenheit. Our stock HD 5870 peaked at 75 degrees Celsius (167 degrees Farenheit), while the overclocked R5870 Lightning reached 78 degrees Celsius (172 degrees Farenheit). With the synthetics out of the way, we can get down to the real-world performance. All of our tests were performed at 1920-by-1200 and 2560-by-1600 resolutions, at the highest available settings, alternating between disabling and enabling anti-aliasing. There were no real surprises in our testing of Tom Clancy's HAWX, a DirectX 10.1-based combat flight simulator.This particular test models cities, which are summarily destroyed by dogfighting aircraft and attack helicopters. Lighting and shadow-mapping are important here, with large outdoor environments bathed in sunlight. While the GeForce GTX 480 is fastest here, it's sort of a moot point; only at 2560x1600 with anti-aliasing do any of the cards ever fall below an average of 60 frames per second. 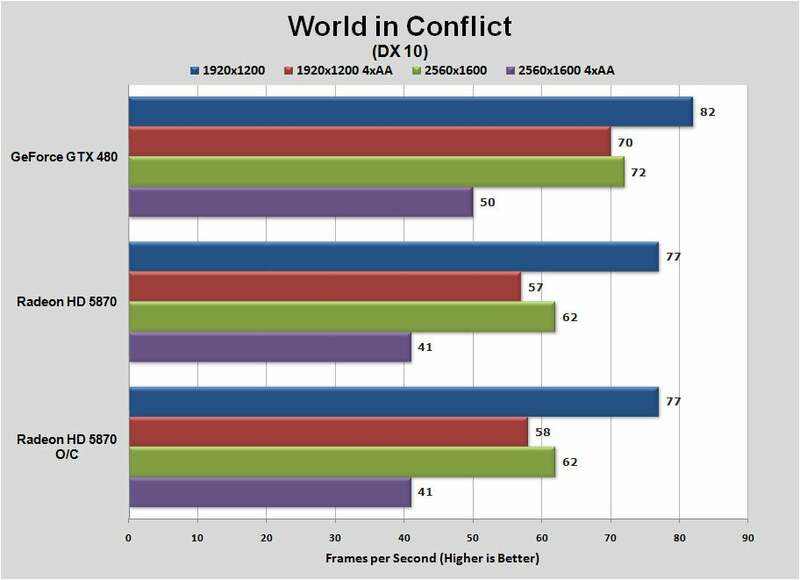 Performance results for Ubisoft's World in Conflict were equally unsurprising. It's a DirectX 10-based real time strategy game, offering up plenty of detailed models and volatile explosions to challenge the GPUs. Nvidia's new high-end card typically runs this game around 16-20% faster than the less expensive Radeon HD 5870, except at lower resolutions without anti-aliasing applied. As with HAWX, only at 2560x1600 with AA do any of the cards really start to break a sweat. Dirt 2 is the first of our DirectX 11 game tests, and it incorporates several enhances features in its DX11 mode including tessellation, ambient occlusion, and high dynamic range texture formats. 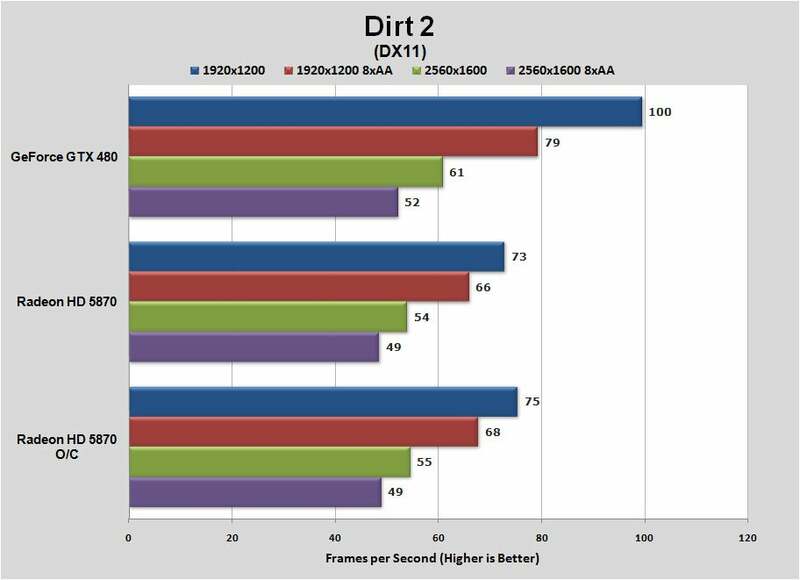 The GTX 480 continues to pull ahead, this time the margins grow wider as the resolution and AA modes drop. At 1920x1200 with no AA, it's as much as 30% faster. Crank it up to the highest resolution and quality settings and the gap shrinks to less than 10%. All three cards exceed 60 frames per second at 1920x1200 with 8x anti-aliasing applied, which is all most users will need. Finally, there's S.T.A.L.K.E.R. 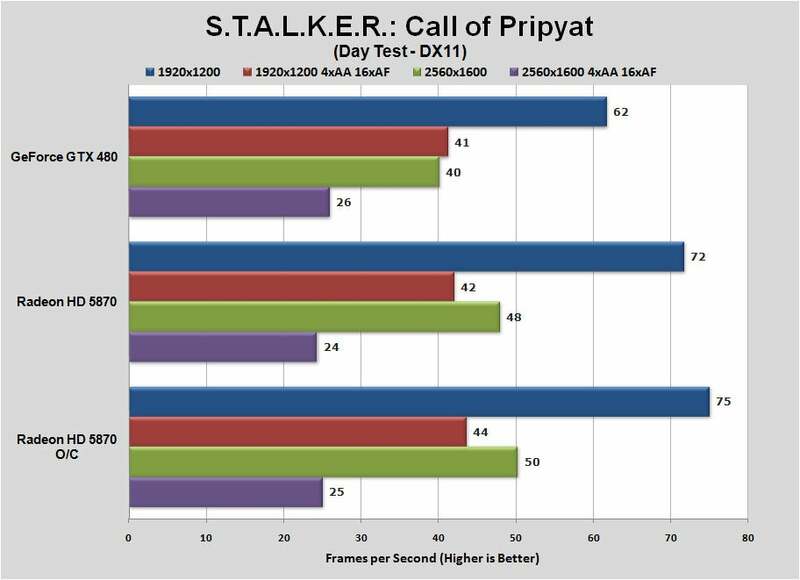 : Call of Pripyat, another DirectX 11 title. This test was interesting: until we pushed the settings to their upper limits, the GTX480 was dead last. While this does look like an anomaly, we may have puzzled out the issue by taking a closer look at the cards' specifications: the GTX 480 is equipped with 60 texture mapping units, as compared to 80 inside the 5870s. As a result, the card is ultimately texture-bound -- a limiting factor in our Pripyat benchmark, which relies on spacious, heavily textured scenes. At the absolute upper limits the GTX 480 clambers back on top, eking out a single frame of performance higher than the competition. Superior anti-aliasing, but fumbling on textures -- it's ostensibly a case of shirking the basics, in exchange for superior top-end performance. Whether or not the GTX480 is worth your hard-earned funds will boil down to practical concerns. Across our gaming tests (synthetic benchmarks excluded), we generally saw a 15 - 20% performance gap, with the GTX 480 sitting ahead for most of them. On the dollars per frame front, its rating is actually not too shabby. At a resolution of 2560-by-1600, with anti-aliasing activated, we averaged about $11.56 per frame-per-second (FPS) on the GTX 480, as compared to $11.41 on the 5870, and $13.18 on the overclocked 5870. On a strict price-per-frame metric, the 5870 is the better deal -- by about 15 cents. That minute gap starts to get quite a bit wider when you factor in your monthly electric bill. Saddled with the GTX 480, our system utilized 140W of power when idle -- the 5870 used 106W, the overclocked 5870 used 118. Under load, we saw a whopping 365W with the GTX 480, versus 256W and 276W with the 5870 and the overclocked 5870, respectively. Translated into watts-per-FPS, the 5870 is about 21% more efficient than the GTX 480. Its overclocked sibling is about 16% more efficient. Even if you were willing to eat the 15 cent price-per-frame measurement, the noticeably higher power consumption rate will ultimately take its toll. Fun Fact: When we pushed the cards during our FurMark test, we saw 460W at load on the GTX 480, versus a maximum of 336 on the 5870. Again, Furmark isn't a realistic measurement, but it's always an interesting number to keep in mind. All things considered, there's a lot to like here. The Fermi architecture has a lot to offer, particularly where anti-aliasing or tessellation are concerned. The 5870 does have a considerable advantage over the GTX 480 in a number of places. It's overall power draw is lower, it often delivers comparable performance for less, and some perks -- powering 3 displays from a single GPU -- have yet to be addressed by Nvidia. As it stands, until the more games start to take advantage of the technology that Fermi hopes to offer, we'd advise weighing the performance, power, and price benefits before handing over your credit card.